Today we are previewing new features for Power BI, our self-service business intelligence solution designed for everyone. Power BI reduces the barriers to deploying a business intelligence environment to share and collaborate on data and analytics from anywhere. We are introducing a number of new Power BI features available for preview including dashboards, new visualizations, support for popular software-as-a-service applications, a native iPad app and live “hybrid” connectivity to on-premise SQL Server Analysis Services tabular models. These preview features are available for customers with a United States address. We’ll incrementally add new country support as we extend the preview globally in the coming months. Existing customers will find a preview option in their current Power BI sites. For those not currently using Power BI, you can sign up for a Power BI preview which includes the new features here. Users can create personalized dashboards to monitor their most important data. A dashboard combines on-premises and cloud-born data in a single pane of glass, providing a consolidated view across the organization regardless of where the data lives. Users can easily explore all their data using intuitive, natural language capabilities and receive answers in the form of charts and graphs. They can also explore data through detailed reports that target specific aspects of their business. Visuals from these reports can also be pinned to their dashboards for continuous monitoring. As part of this experience new visualizations have been added including combo charts, filled maps, gauges, tree maps, and funnel charts. 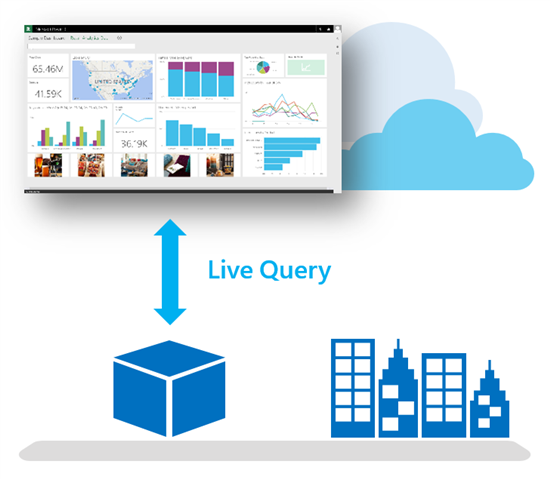 Power BI now provides “out of the box” connectivity to a number of popular SaaS applications. In addition to the existing seamless connection with Microsoft Dynamics CRM Online, with today’s release customers can also connect to their data in Salesforce, Zendesk, Marketo, SendGrid, and GitHub with many more to come in the months ahead. With an existing subscription to one of these services, customers can login from Power BI. 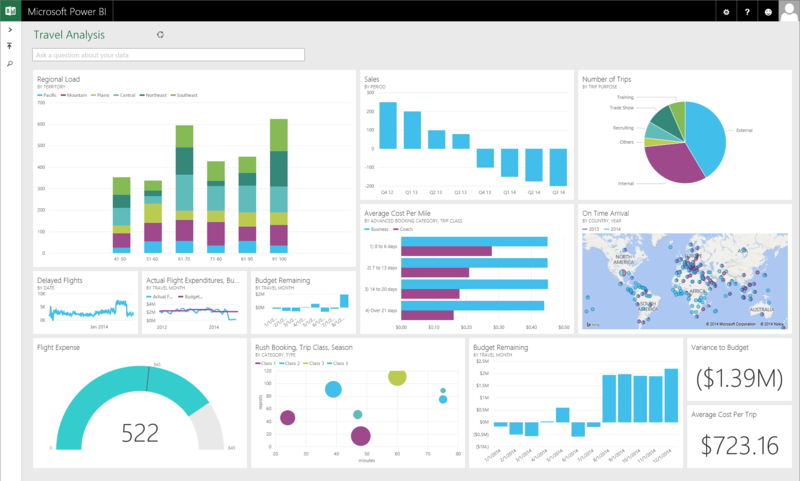 In addition to establishing a data connection, Power BI provides pre-built dashboards and reports for each of these applications. Excel 2013, which comes standalone and with Office 365 ProPlus, is Microsoft’s premier business analyst tool – it includes rich business intelligence features (Power Query, Power Pivot, Power View, Power Map) fully integrated with the powerful ad hoc analysis capabilities and familiar features of Excel – like Pivot Tables and Excel Charting. With Excel 2013, analysts can publish Excel Workbooks to Power BI, and share data, analysis and reports with Power BI users. For Power BI customers who don’t have Excel 2013, the new Power BI Designer provides a solution expressly designed for Power BI report creation. It can be used to import and model data, then author and publish Power BI reports to the Power BI service. With the new Power BI connector for SQL Server Analysis Services, customers can realize the benefits of a cloud-based BI solution without having to move their data to the cloud. Customers can now create a secure connection to an “on-premises” SQL Server Analysis Services server from Power BI in the cloud. When users view and explore dashboards and reports, Power BI will query the on-premise model using the user’s credentials. With this hybrid solution, organizations can continue to retain, manage and secure their data on-premises, while securely enabling users to benefit from that data via Power BI. We are working on a wave of native mobile apps for Power BI. These apps will allow users to access their Power BI dashboards and reports through immersive mobile experiences for iPad, iPhone, and Windows tablets. The first of these – the iPad app is available today and can be downloaded from the Apple App Store, with other platforms following in the coming months. All Power BI mobile apps enable users to share insights and collaborate with colleagues so that they can take immediate action, from anywhere, anytime. We welcome you to preview the new features for Power BI and look forward to your feedback.